In the episode 10 of KBS 2TV series Dream High 2 broadcast on February 28th, 2012, JB and Shin Hae Sung (Kang So Ra) staged an embarrassing love scene. 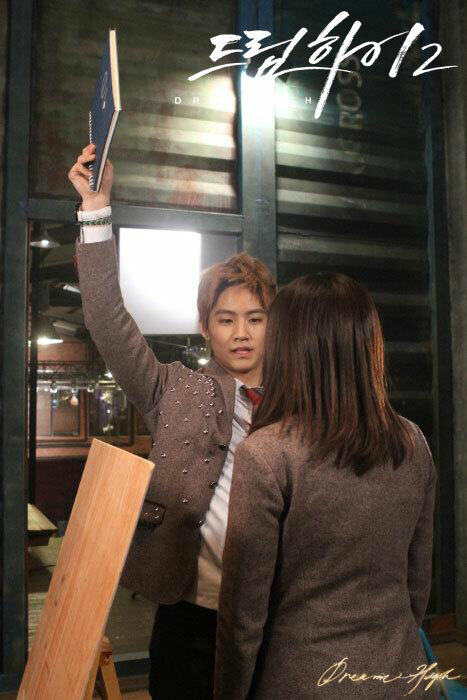 Due to high grade class has been canceled, JB has to attend the lecture at the inferior class where Hye Sung is. The lecture on the day is about self-portrait, and JB holds mirror to please her. When Hye Sung is concentrating on drawing, JB secretly look at the notebook of Hye Sung, and found that inside the notebook is the his portraits drew by Hye Sung. JB wittingly wants model fee from Hye Sun, while Hye Sun shyly wants back her notebook. When they scramble over the notebook, they suddenly fell to the ground. The two persons fell face-to-face, almost lips touching lips, and the scene is very embarrassing. And Jin Yoo Jin (Jung Jinwoon) couldn’t stand JB courting Hye Sun, starting to jealous of him.